KMZ ZORKI 3.5cm Finder for LEICA 3.5cm / 35mm Lenses. made by LEICA, REID, Canon, Nikon, Voigtlander, Konica, FED, Zorki etc. There is dust trapped inside, but image produced is perfectly well visible! Helios mk2 multi frame viewfinder. NEW. Leica FOKOS Silber Chrom. LACKIERUNG / PAINTING. BLENDE / APERTURE. Objektivdeckel/Front Cap. Distance ring turns in smooth motion. One of the secondary windows has cracked. Keine Nennenswerten Gebrauchsspuren /. Model: APDOO. Check-Out Later. "EXCELLENT CONDITION.". 80 to 89 percent of original. Shows moderate wear for the age of the item, with the possibility of small dings or blemishes. Glass may have slight blemishes but will not affect picture quality. Balancing lighting by eye is a matter of experience. Decisions can be aided through the use of contrast viewing filters. These are designed to handicap the eye, with its much greater range of apparent densities, to resemble the range of the various types of film. Gebrauchsspuren, technisch einwandfrei. Senden Sie uns eine Nachricht. B guter Zustand, normale. D defekte Ware ohne. A Neugerät nicht. Gewährleistung und Rückgaberecht. strong used but full working. Leitz AUFSU. Leitz AYOOC. Leitz AHOOT Finders. GENUINE Leather Case designed for. A screw mount version of the 135mm Hektor. Aperture blades clean and free of oil. The optics are ok, cleaning marks are present, a little internal dust and the lightest touch of haze. Graded: Excellent. Our gradings indicate when lens imperfections could affect the image quality. Marks that may be considered unsightly, though will not affect the picture. The grades are:'. 4: Signs of light use, but not misuse. 135mm 1:4.5 Hektor screw mount lens with A36 head. A screw mount version of the 135mm Hektor. Leitz Leica. The focus ring is smooth, the aperture ring is positive in operation. Aperture blades have a small amount of oil but nothing to effect use. ROSOL / 12040. Leitz Leica. Leitz Leica. Angle viewfinder R.
Seawood Photo - The Best in the West since 1947! The two lenses can be used together to create a N3 close up lens. LEICA LEITZ WETZLAR (FODIS) RANGEFINDER (26379). Designed for the whole range of rangefinder lenses 85mm (8.5cm). Canon 85mm Shoe Mount Finder. In Fully Working Order! E. Leitz E.Leitz Wetzlar FODIS Entfernungsmesser Rangefinder Messsucher - Lesen! In einem stark gebrauchten Zustand, funktionsfähig. Dia & Film. Foto Zubehör. 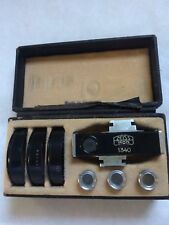 This is a desirable set for a Zeiss collector or to use. Pentacon Six mirino magnifier 2,7x con regolazione diottrica. Imballo originale. 135mm 1:4.5 Hektor screw mount lens with A36 head. A screw mount version of the 135mm Hektor. Leitz Leica. Scale in feet. Aperture blades have a small amount of oil but nothing to effect use. Leitz Leica. Short base rangefinder in black and nickel finish. Supplied with hard to find nickel mounting clip which may be non-genuine. Scale in feet. Good definition of the finder image.
" CUNCTATOR ". le réglage du retardateur se fait par l'aiguille en laiton pointant une graduation de 1 à 30. pour stéréoscope RICHARD. Très bon état. en fin de course le volet s'ouvre laissant apparaitre deux carrés orange. Made In USA. Tested and shows close enough distance. For example: instead of infinity shows about 100ft. THE REST OF THE WORLD You can see small amount of glue in ocular, but it was made like that and does not affect viewing. RARE and Useful Accessory by ZEISS Ikon! It is unusual for ZEISS not to indicate focal lengths for each setting. Ernst Leitz Wetzlar early Leica WINKO. Shoe Mount External Viewfinder made in Germany in 1929. For LEICA L39 or Leica-M 13.5c m/135mm Lenses. Shoe Mount Finder with Parallax Correction. Mamiya Vertical Viewfinder M645 1000S M645J. Mamiya M645 1000S, M645J Vertical Viewfinder. Used In Conjunction With The Mamiya Prism Finder. Leitz WINTU Right-Angle Finder / Angle Viewfinder. Ernst Leitz Wetzlar. 5cm 1:3.5 Elmar Red Scale lens. Leitz Leica. make Supersized seem small. Aperture blades are free of oil. Topzustand, leichte Gebrauchsspuren. Modell: Zeiss Ikon. Model: Zeiss Ikon. Zustand: sehr gut. GENUINE LEICA L39 / LTM Rear Lens Cap Brass Black Paint. ORIGINAL ITEM MADE BY LEITZ ! 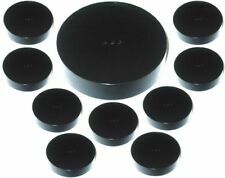 This is not covered by the warranty and is easily done by the user. Zeiss Ikon Viewfinder 8.5 cm. made in USSR. It is marked "8.5 cm" and "24x36.". Leica M film pressure plate. FISON / 12510. Leitz Leica. 50mm 1:3.5 Elmar uncoated lens. Leitz Leica. 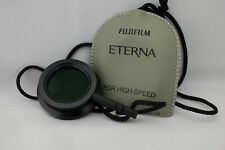 The focusing and aperture rings operate smoothly. Leitz HEBOO. Designed for LEICA Standard & LEICA II models (including IIf). It is as easy to use as cable release! HOOIV / 13131. Leitz Leica. Works well and is clean/clear. The zipper on the case is broken. Leather case is in very good condition. It is tiny, 2.5 inches long. I have no idea what the parts are that are inside of it. They are as-is. Nippon KOGAKU Japan E.P (Export Version!). 13.5cm /135mm Shoe-Mount Finder. 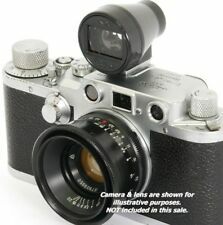 Designed for ANY 135mm / 13.5cm rangefinder Leica M or LTM mount lens! In Fully Working Order! CANON LEATHER CASE FOR CANON VI-T - EXCELLENT! This is a rather lovely thing, a genuine and vanishingly rare leather case for the seminal Canon VI-T. CANON VI-T LEATHER CASE. An excellent example of this rare canon case! The case is made of brown leather with green velveteen interior, the design incorporates a hump to accommodate top mounted accessories such as finders.